Farrar, Straus & Giroux, 288 pages. Late in Gunnhild Øyehaug's Wait, Blink, Dante is walking through the icy reaches of hell and encounters the heads of each of the major characters in the novel. Virgil tells him to leave them alone; Dante covers them with snow and moves on. It is an apt metaphor as each individual lives so much in his or her head that they are, in a sense, disembodied. They are certainly cold, isolated, and alienated from all things collective. Øyehaug's novel is partly a literary delight and partly a philosophical journey reminiscent in tone (but not content) of Robert Pirsig's Zen and the Art of Motorcycle Maintenance. It's also an offbeat exploration of postfeminism, a slippery term that generally accentuates lacunae and contradictions within feminist theory. Øyehaug's work—translated from Norwegian—will reward the patient reader and frustrate those who simply want to chow down on a page-turner. This one is definitely not the latter; in fact, there are (literally) sentences in the introductory sections of the book that took up an entire screen of my Kindle. We meet four women, each in inappropriate relationships with older men, though age probably wouldn't matter to anyone in this novel. As suggested above, for the most part these are people held prisoner by their own inner thoughts, musings, and fears. They are the sort who end relationships because of disagreements over Sofia Coppola films or the deeper meaning of Kill Bill 2—movies certainly open to interpretation, but probably not the kind that would cause most folks to suffer existential crises. But our characters are not most people. Sigrid is a 23-year-old literature student who lives in dreams and metaphors. She has a picture of literary theorist Paul De Man on her wall, as well as a poster of Van Gogh's painting of sunflowers, though she's a bit embarrassed by the latter as many her circle would find those sunflowers trite and clichéd. Read what you want to in the fact that one of De Man's most heralded works is titled Blindness and Insight. Sigrid is a fragile thing that can never trust herself—each insight generates its doubting opposite. Øyehaug casts her as akin to Dante's Beatrice, a symbol of sublimation. She is obsessed with film images of women wearing oversized men's shirts* and ponders its feminist implications. Sigrid will eventually drift toward author Kåre Tyvle, twenty years her senior, who is also plagued by self-doubt and is in mourning for his broken relationship with Wanda, a free-spirited bass player. Wanda aches with loss as well, but can either she or Kåre break through the intellectual fissures that drove them apart? Moreover, can Wanda ever live up to the post-breakup pedestal upon which Kåre has placed her? Twenty-something Linnea poses postfeminist challenges. On the surface she's a self-driven and determined filmmaker. In private she's been involved with 47-year-old Göran, a married literature professor obsessed with his own views on literary theory and his own ego—though given the nature of this novel, he's also weak and crippled by all doubts that go bump in the night. Linnea's drive blinds her to many things, including the unlikelihood things will go anywhere with Göran, or that she has a hangdog suitor in 51-year-old Robert, ostensibly her producer, but one lacking the courage to declare himself or to tell Linnea her film will never be made. Our cast rounds out with 28-year-old Trine, an explicit performance artist, but one whose private life doesn't match her image; she's estranged from the father of her child and how can she possibly perform genital-content art when her breasts are so swollen with milk that she's in pain? And then there's Elida, a fishmonger's daughter, who first saw Viggo when she was 9 and he 19, attending his grandmother's funeral, bloodied, and missing a tooth from a bicycle spill. She's pined for him ever since, but Viggo still carries ghosts and terrors. The wild card in the mix is Magnus, the ex of several women in the novel. 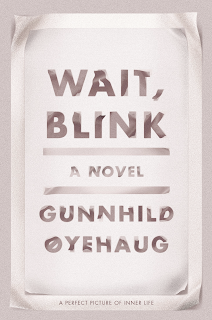 If you get the sense that Wait, Blink is a danse mélancolique, you are correct. The title words pop up in various and unusual places and, like most things in the novel, are metaphors for the situations in which the characters find themselves. All of them, by the way, seem to have read Cervantes, Dante, Ibsen, and Kafka—among others. You can draw conclusions from that, just as you can mine the entire book for archetypes, symbolism, and metaphors. What does Øyehaug want us to take away from this? What is her overarching view of modern feminism? I'd be lying were I to say I'm sure of any of that, but if it was her goal to make us put aside assumptions and contemplate such things, she has succeeded in spades. Let me reiterate; you need to put on your thinking hat for this one. What is a house? It is, of course, a domicile in which we live, but it’s also a refuge, a center of social life, and a place often that walls us off from the outside world. 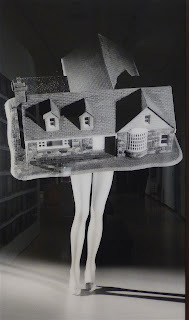 The Mead Art Gallery of Amherst College shows houses—in photographs, models, drawings, and in artistic rendering—in a work that doesn’t ignore politics, social class, or access to capital, but chooses instead to consider the aesthetics of houses. In other words, the house as design. There are works from such well-known artists as Louise Bourgeois, Cindy Sherman, and Ai Weiwei, though you’ll probably be more intrigued by the thoughts of those whose names are less famous. Here are a few things that struck my fancy. I liked the colors and sereneness of Ai Weiwei and its idea of a shelter as a place of contemplation. 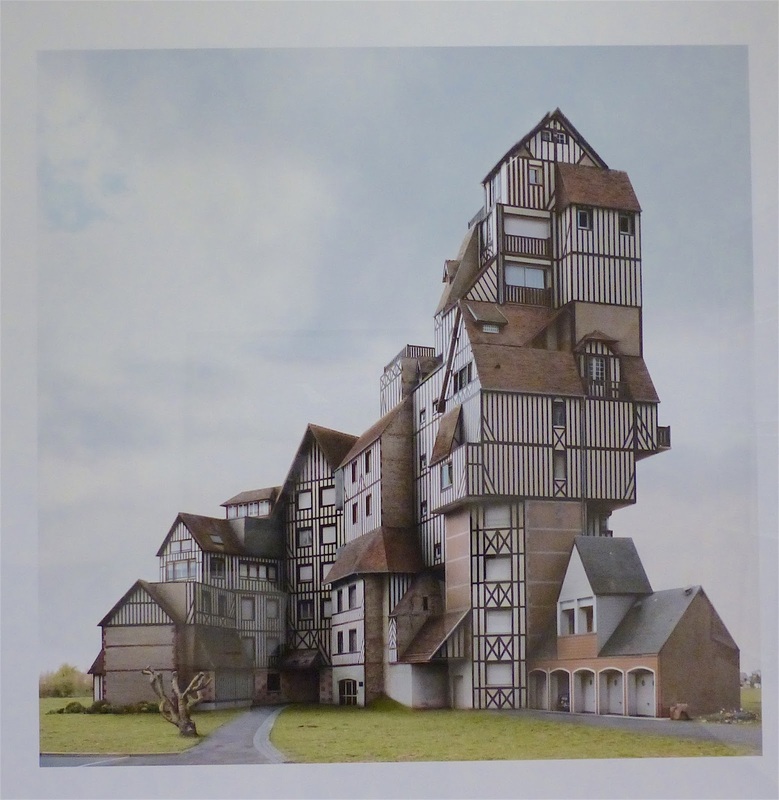 The Dujardin captivates my imagination. It is, of course, a fantasy complex—of sorts. 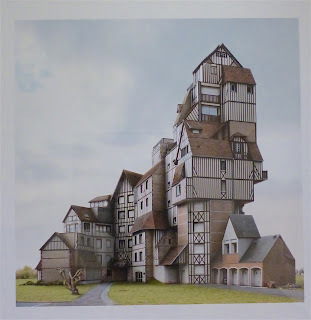 Dujardin fashioned it by seamlessly stitching together various photographs. Politics comes into play in Goldblatt's photo from South Africa. Somehow we doubt this development will ever be built or that this dark-skinned African man will even live in such a place. It is wry commentary on the remnants of apartheid. 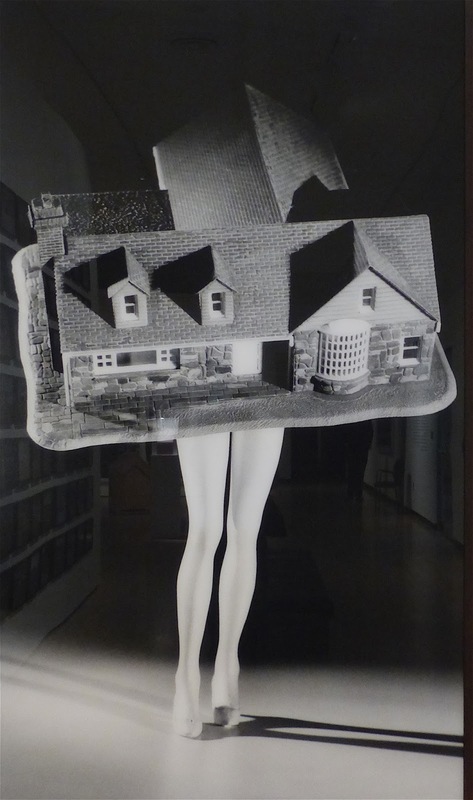 Speaking of wry commentary, Simons' assemblage challenges us to think about how homes are made into fetishes that are tied into sexual and domestic life fantasies that (in this case literally) weigh heavy upon women. Muniz gives us a home covered in dripping chocolate. He's actually more of a chocolatier than an artist, but this one appeals to my inner cocoa-flavored Hansel and Gretel memories. Verona Walk is scary because it's a real aerial photograph. The gallery notes go on about subtle differences showing through, but that's rubbish! This is the ultimate nightmare--cookie cutters in the Galdes from where I sit. Or call it the massing of the masses--all decked out in their mortgages with nowhere to go. My favorite was the mixed media assemblage from Radcliffe Brown--wood, paint, and tin types he inherited, some of which go back to the Civil War era. It's a powerful reminder that "home" was often makeshift for slaves, to say nothing of being ephemeral and changing.